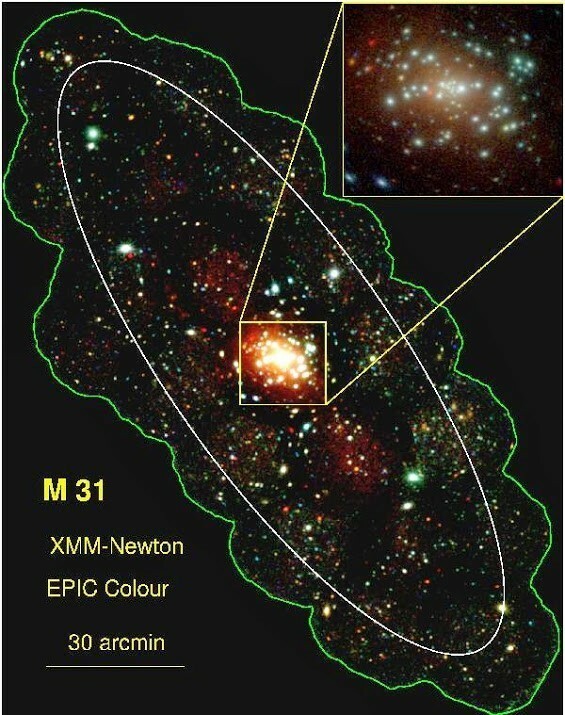 The image below is the first complete x-ray survey of the Andromeda galaxy. The Andromeda galaxy (also known as M31) is about 2.5 million light years away. It is a spiral galaxy very similar to our own Milky way, so surveys of Andromeda are very useful in understanding galaxies like ours. The survey observed almost 2000 x-ray sources, and from these a few patterns can be seen. For example, the survey identified dozens of supernova remnants, and these tend to be located within the star forming regions of Andromeda. This would imply that these are remnants of very large stars. Other sources were identified as x-ray binaries. These are binary systems consisting of a regular star and a compact partner such as a neutron star or black hole. Gas from the star is captured by the compact partner, which heats it tremendously, resulting in x-rays. More than half of x-ray sources couldn’t be identified as either given the limits of the survey, so it will take further observations to determine what they might be. Still, this the most detailed x-ray survey we’ve made of a galaxy beyond our own.